Photographer, 27 York Place, Brighton. Mann was in business at this address by 1903, and continued until at least 1922. He specialised in portraiture, including both individual and group pictures, which he sometimes arranged to be printed as picture postcards. In 1908 and again in 1909, for example, he issued halftone cards showing the Brighton Friendly and Traders Societies' Hospital Saturday Committee. Another card, printed as a halftone, shows the Brighton Congress Hall Brass Band, posing with their instruments. Although Mann often took the trouble to emboss his cards with his name and address in the bottom right corner, in many cases he failed to include captions to explain the purpose of the photographs or identify the subjects. 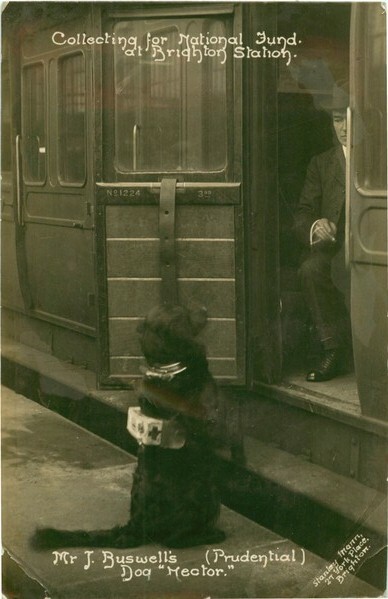 A favourite with Brighton collectors is Mann's black and white real photographic card dating from the Great War, which shows a dog on a platform at Brighton Station begging from a passenger in a railway carriage. It is entitled "Collecting for National Fund at Brighton Station. Mr J. Buswell's dog 'Hector' (Prudential)". Mann's name and address is written diagonally across the lower right corner of the photograph. An embossed card of Withdean Court in Brighton provides four views of the house and its grounds. Stanley Mann was born in Lambeth, South London, in 1871. His father, Samuel Mann, who had been born at Brixton in about 1834, worked as a commercial traveller. His mother, Eliza Mann (née Hartley), was about the same age as his father and came from Yeovil in Somerset. Stanley was the ninth of eleven children. Eliza, perhaps weakened by repeated childbirth, died in Lambeth in 1884, aged 51. Some time later Samuel moved with most of his children to Sussex. The 1891 census records that both Stanley and a younger brother, Sidney, were photographers, living with their father at 3 Hove Terrace. Stanley Mann married Constance Lucy Towgood at a Brighton Congregational Chapel on June 1, 1897. He gave his address as 40 Surrey Street. Catherine was 19 and the daughter of Sidney Towgood, a deceased stockbroker. The 1911 census records that the couple were living at 27 York Place and had two children: Kathleen Mary Mann, aged 12 and Ronald Stanley Mann, aged 8. It has not been discovered whether they went on to have more children. Kathleen helped her husband with his business. Stanley Mann died at Brighton in 1924. He was only 53.